On the day someone joins your mailing list, you’ll never have a better shot at their attention. This is a great opportunity to introduce them to your art and the underlying ideas and emotions of your work. The easiest way to do this is with your origin story. Earlier in the challenge I suggested that you prepare your Hero’s Journey story. This email is a great time to share the thing that was your Call to Adventure. Here’s a great example from Art by Deann. Then Deann inserted a link to a video of her making art. Gotta get that call to action in. 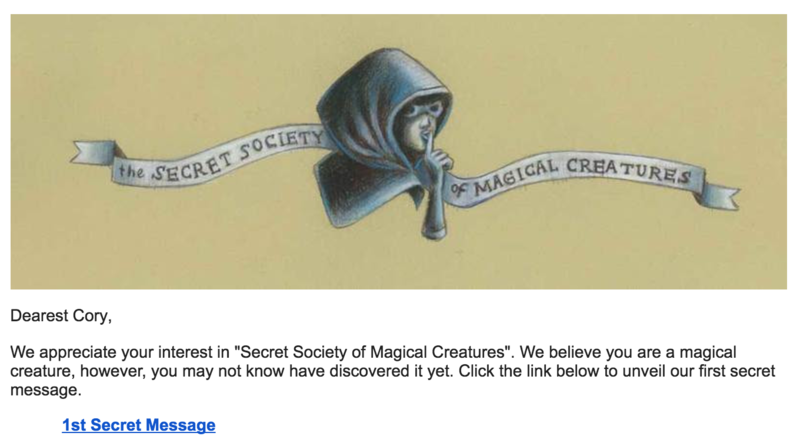 art by deanne email << Here’s a full pdf of that email. The secret here is not necessarily to pitch a sale. It’s the first step in something called an “indoctrination sequence.” You’re orienting your collector to your world and familiarizing them with your brand. If you want to get really fancy, you can flip the Hero’s Journey story around. Make your collector the hero, and position yourself as the mystical guide – the person who is going to take them on a journey of self discovery and change. 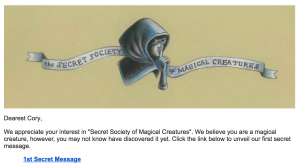 That’s what Melissa Kojima has done with the Secret Society of Magical Creatures. She’s helping people discover what kind of magical creature they are, positioning them to pay her for a commission of their creature later. So, go forth and create your origin story email, and set up your first auto responder. BTW, there are lots of ways to do this. This is just one. You can literally build a career out of all of the different ways to do really great email marketing. If you want further study, check out Dan Kennedy’s copywriting books, as well as Andre Chaperon’s Autoresponder Madness course. You can Google them. Later on this week, we’ll be opening up enrollment in The Abundant Artist Association, where you can learn more about email marketing and how to effectively tell your story. It’s funny, in my side-life as a Mindset/Peak Performance coach, I’ve been using autoresponders and email lists for 20 years+. But some odd thing just got un-jammed, and my head did a kind of Exorcist twist inside, and I’ve got some of the coolest ideas flowing! Thank you for that – it’s like I suddenly have permission to be as weird as I really am!! The template is amazing. Thanks Cory!